Join us in Las Vegas to talk about our new nanoStream software solutions for Mobile, Desktop and Browser based Live Video Encoding. See how easy it is with our nanoStream technology tocreate your own professional live streaming applications (for live production of news, sports, music, worship, conferencing, chat, and many other use cases). Live video streaming is buzzing! Maybe you heard about Meerkat and Periscope. You want the live video encoding and streaming experience in your app? 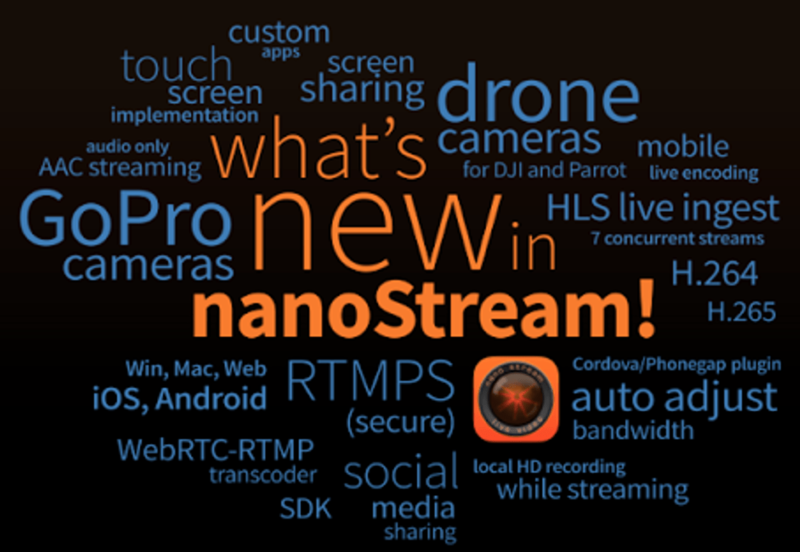 Adding live video streaming to your app has become very easy with nanoStream. Would you like to take live video from your mobile camera, a GoPro camera or the DJI Phantom or Parrot’s Bebop and share it through social media? Then visit us at our booth SU13212 to talk about our easy-to-use nanoStream Toolkits and nanoStream App’s for adding live encoding and streaming on Mobile (iOS and Android), Desktop (Windows and MacOS) and Browser environments. New Reference Applications for Testing and Sample Source Code! Visit our Download Page for Evaluation Software! All platforms include H.264 and AAC encoding and RTMP streaming, compatible to existing media server and CDN systems. The nanoStream SDK and Apps for Windows, MacOS, iOS and Android can perfectly be used to create your own custom branded live encoding applications. You can license our software for your own deployment, or use our rebranding services for a fast to market solution. Professional software development services and consultancy are available as well. The nanocosmos software is based on our own inhouse developed technology for audio/video encoding, decoding and streaming formats and applications, not requiring third party components or critical open-source license. Features and functions include live encoding for streaming and recording, adaptive bitrate, MP4/H.264/H.265/AAC, MXF, RTMP, RTSP, UDP, HLS/TS, Screen Sharing, Meta Data Ingest, Broadcast Integration, HD Video Mixing and overlays, WebRTC. Contact us for a meeting or more information. Treffen Sie uns in Las Vegas, um über unsere neuen Software-Entwicklungen für das Live-Video-Streaming zu sprechen. Mit der nanoStream-Software ist es sehr einfach, kundenspezifische Live-Anwendungen bereitzustellen. Verfügbar als SDK, Apps, Anwendungen für Windows, MacOS, iOS, Android. Neben der nanoStream Live-Encoder-Software bieten wir Codecs und Broadcast-Module an für filebasiertes Transcoding mit H.264, MPEG und MXF. Zusätzlich sind Support, Beratung und Entwicklung als Option verfügbar. Nehmen Sie Kontakt auf für ein persönliches Treffen oder weitere Informationen.